Geneticist Rick Kittles probes African-American genetic ancestry for data that could help resolve health disparities in communities of color. You’ve probably seen the statistics: African-Americans experience significantly higher risks for cardiovascular disease, diabetes, obesity, hypertension, stroke, and certain cancers compared to white and Hispanic Americans. But while the health disparities between different racial and ethnic groups are undeniably real, experts say, the way we traditionally think about race and disease risk is flawed. Rick Kittles is a professor and founding director of the division of health equities within the department of population science at City of Hope, a cancer research and treatment center in California. 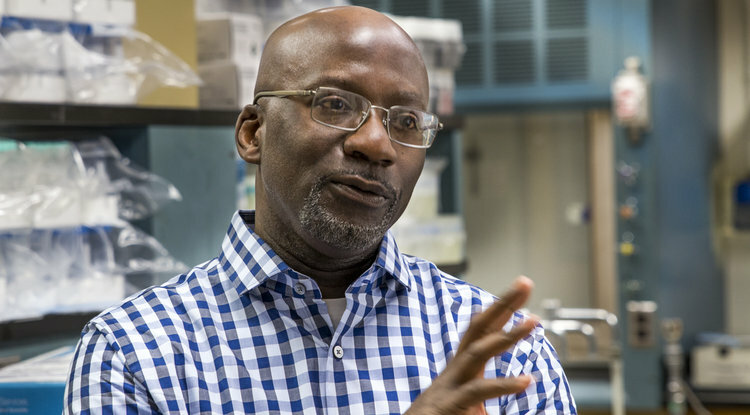 A geneticist by training, Kittles has dedicated his career to cataloging African-American genetic diversity and identifying the genetic variations that contribute to increased risk for certain diseases in communities of color, particularly prostate cancer. But when a geneticist talks about race and risk, things get complicated. Race, explains Kittles, is often used as proxy for genetics and biology, but it’s a weak proxy. In America, race is defined by skin color, but a person’s skin color says very little about their underlying genetic makeup. You and your family may identify as African-American, for example, but actually have more European ancestry than some white people. Society says that you’re “black,” but your genes tell a much more complex story. If we truly want to fix the very real health disparities experienced by different groups, argues Kittles, we have to stop defining those groups by arbitrary phenotypes like skin color and start relying on actual genetic ancestry. Of the three billion nucleotide base pairs of DNA in the human genome, roughly 15 million of them are responsible for the genetic variations associated with disease risk. When population geneticists analyze these variations, called single-nucleotide polymorphisms, they find that they tend to cluster in people from the same geographic regions. Variations that occur with high frequency in specific regions are called ancestry informative markers. That’s why researchers like Kittles can say with certainty that African-Americans are mostly of West African descent, because on a macro level they share so many of the genetic markers that are found almost exclusively in people from West Africa. This makes sense historically, says Kittles, since 95 percent of slaves captured in West Africa were brought to the Americas. Still, just because African-Americans share a similar genetic ancestry, it doesn’t mean that they are a genetically homogenous “race.” In fact, it’s the exact opposite, says Kittles. There is far greater genetic variation among people of African descent than Europeans. For starters, Africa is the biodiverse cradle of humanity and even modern West Africans exhibit great physical diversity across the region. For African-Americans, that baseline diversity has been compounded by centuries of genetic “admixture,” the addition of DNA from Europeans and Native Americans. The result is that African-Americans, although often lumped together as a single “race,” in reality represent a broad diversity of genetic backgrounds. When Kittles tested his own DNA — he’s the co-founder and scientific director of African Ancestry, a genealogy and DNA testing website for people of African descent — he learned he was 80 percent West African, 12 percent European, and 8 percent Native American. What this means is that race, as defined by skin tone, is not particularly useful information for determining the innate biological risk of disease. That’s why one of Kittles’ missions throughout his career, which included founding the National Human Genome Center at Howard University, has been to make sure that the true genetic diversity of people of color is reflected in our growing database of genetic risk markers. Without more robust genetic data about African-Americans, the same communities that suffer the greatest health disparities today will likely benefit the least from tomorrow’s medical breakthroughs. That’s because the future of healthcare is precision medicine, says Kittles, or tailoring diagnosis and treatments to an individual’s personal genetic makeup. For that to work, clinicians will not only need to sequence the patient’s own genome, a process that gets cheaper and faster by the day, but they’ll need context for what that genome says. They’ll need a knowledge base that includes all of the African-American genetic variants, so a physician can confidently say, “90 percent of people of African descent with this variant are at a high risk of kidney disease or colon cancer.” Without that knowledge base, underrepresented communities will remain underserved. At City of Hope, Kittles and his colleagues are doing their best not to let that happen. At the end of the day, though, genetic ancestry only tells part of the story of why some populations have worse health outcomes than others. A big part of Kittles’ work is gauging and teasing apart the environmental factors that impact health in African-American communities, including behavioral risk factors like diet and exercise, lack of health insurance, and the compounding physical and emotional stress of racism. Just because race isn’t a biological fact doesn’t mean that racism isn’t real. We told you it was complicated.